If you can sit in the river, it’s probably not necessary to wear a flotation vest. It’s hard to beat the shallow waters of a little river when the temperature climbs into the 90s, as it did again Tuesday. In that department, we’re pretty well positioned in the mid-valley. The view above is from the Calapooia River bridge on Queen Avenue/Oakville Road. The gravel bar in the background is always a popular place for families to gather to escape the summertime heat. 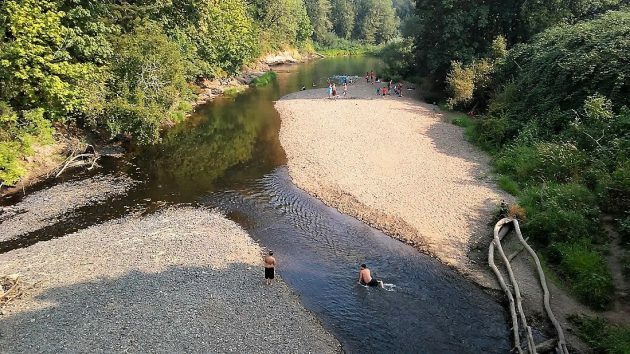 There are places like that on the Willamette and Santiam too, especially now that the rivers are running relatively low. For decades now, federal and state regulations have sought to make our waterways “swimmable” and generally clean. And every summer we see demonstrated the fact that the campaign has succeeded. People can dip into our rivers without undue risk of floating in pollution. Thanks for the reminder of the gift from nature that blesses us all! Thanks too for the political will that it has taken to return polluted waters to “swimmable” … Our quality of life is fragile and demands on resources increase with population … ever more pressures requires ever more protections. If they are not saving us from dangerous building design, they are sticking their noses out keeping public water clean and enjoyable. When are the bureaucrats going to learn that public waterways are none of the public’s business and are there for the whim of the corporations to use as waste facilities? Well it is a blessing that our mid-valley streams and rivers are not from coal country. Under 45, they are now coal waste dumping grounds. Well, at least by his EPA decree.